The book is divided into three parts, each taking place in one of the different homes the Durrells inhabited during their stay on Corfu: 'the strawberry-pink villa'. 'the daffodil-yellow villa' and a 'snow-white villa'. It contains a wonderful cast of characters, starting with Gerald's genial widowed mother and older siblings Margo, Leslie and Larry (acclaimed novelist Lawrence Durrell). Other friends and local identities include the irrepressible Spiro, Dr. Theodore Stephanides (a mentor to the budding young zoologist), and Gerald's eccentric English tutor called George. When the Durrells arrived on Corfu they had brought with them their dog Roger, who accompanied Gerald on his adventures. Along the way, they acquired a menagerie which included Achilles the tortoise, Quasimodo the pigeon, Geronimo the gecko, and puppies Widdle and Puke. My Family and Other Animals is engaging for its humour, its gorgeous descriptions of the wonders of Corfu, and a look at the unusual childhood of one of Britain's leading naturalists. It was made into a BBC series in 1989 and again in 2005, starring Imelda Staunton as Mother. If you want to read more of the Durrell family, the sequels Birds, Beasts and Relatives and The Garden of the Gods are also great fun. 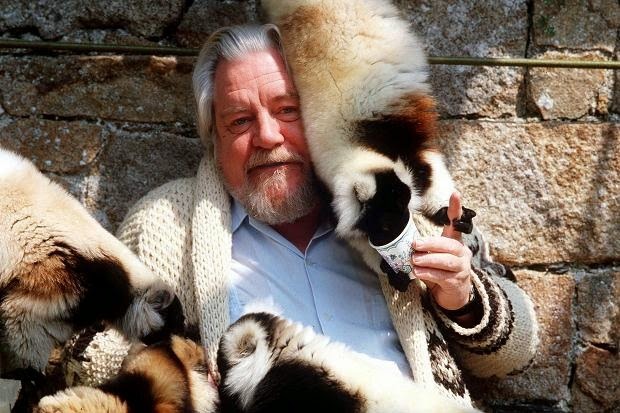 It launched Durrell's career as owner of the Jersey Zoological Park (now Durrell Wildlife Park) in the Channel Islands, as well as novel-writer and television personality; and was also influential in the development of tourism in Corfu. Gerald Durrell was born in Jamshedpur, India, in 1925. In 1928 his family returned to England and in 1933 they went to live on the Continent. Eventually they settled on the island of Corfu, where they lived until 1939. During this time he made a special study of zoology, and kept a large number of the local wild animals as pets. In 1945 he joined the staff at Whipsnade Park as a student keeper. In 1947 he financed, organized, and led his first animal-collecting expedition to the Cameroons. This was followed by a second expedition in 1948 and a third in 1949, this time to British Guiana. He has also made expeditions to Paraguay, Argentina and Sierra Leone. In 1962 he and his wife went to New Zealand, Australia and Malaya to film a TV series Two in the Bush, in conjunction with the BBC Natural History Film Unit. Me a Colobus, Beasts in My Belfry, The Talking Parcel, The Stationary Ark (1976) and Golden Bats and Pink Pigeons (1977).